Fab 5 Freddy (American, b. 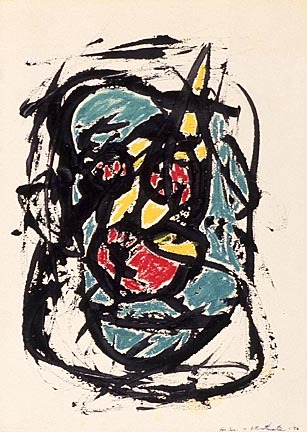 1959), Untitled, 1986. Ink and oil pastel on paper. Milwaukee Art Museum, Gift of Susan L. Strande, M1992.57. A new exhibition Art in the Streets is on view April 17 to August 8, 2011 at the Museum of Contemporary Art (Los Angeles). The exhibition is the first major U.S. museum survey of graffiti and street art and it features an artist in the Milwaukee Art Museum’s permanent collection: Fred “Fab 5 Freddy” Braithwaite. Early on the hip hop scene in Brooklyn, graffiti artist, close friend of Jean-Michel Basquiat, fan of Andy Warhol, and host of “Yo! 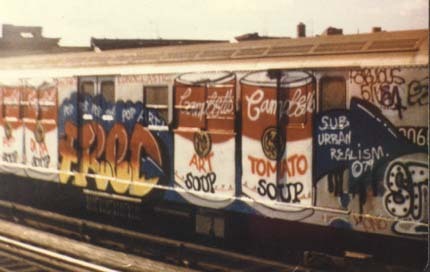 MTV Raps”, Fab 5 Freddy is a pioneer of the street art genre. The Museum’s artwork was a personal gift from Braithwaite to Susan Strande, also an artist and resident of New York. Strande’s niece lived in Milwaukee at the time of the 1992 gift and this is how the Museum Collection was lucky enough to receive this work on paper. Thank you Ms. Strande! You can make an appointment in the Museum’s Herzfeld Foundation Print, Drawing, and Photography Study Center to see this fragile work of art (or any of the other 15,000 or so prints, drawings or photographs in the Collection) by emailing the Collections Manager of Works on Paper at printstudy@mam.org or by calling (414) 224-3817. Detail of signature and inscription. Fab 5 Freddy (American, b. 1959), Untitled (detail), 1986. Ink and oil pastel on paper. Milwaukee Art Museum, Gift of Susan L. Strande, M1992.57. This entry was posted in Art, Art News, Curatorial and tagged Art in the Streets, Contemporary Art, Fab 5 Freddy, From the Collection, graffiti, Herzfeld, News, works on paper. Bookmark the permalink.